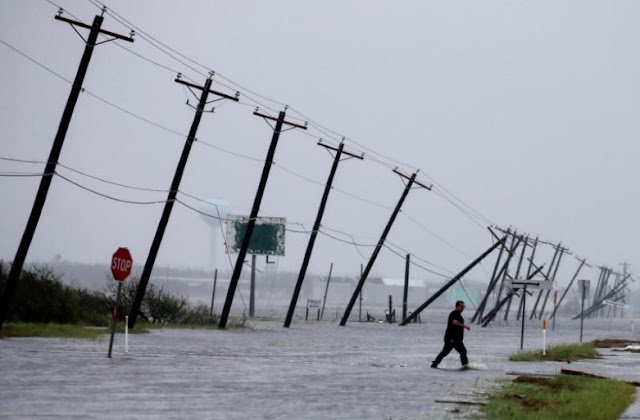 A man walks through floods waters and onto the main road after surveying his property which was hit by Hurricane Harvey in Rockport, Texas, U.S. August 26, 2017. WASHINGTON - U.S. employment fell in September for the first time in seven years as Hurricanes Harvey and Irma left displaced workers temporarily unemployed and delayed hiring, the latest indication that the storms undercut economic activity in the third quarter. “While nonfarm payrolls declined last month, investors will find solace in a whole host of other labor market indicators that reveal an underlying labor market that continues to show evidence of resilience and continued tightening,” said Scott Anderson, chief U.S. economist at Bank of the West in San Francisco. The decrease in the unemployment rate reflected a 906,000 surge in household employment, which offset a 575,000 increase in the labor force. The dollar was trading higher against a basket of currencies after the data, while prices for U.S. Treasuries fell. Stocks on Wall Street fell marginally. That pushed the annual increase in wages to 2.9 percent, the largest gain since December 2016, from 2.7 percent in August. Annual wage growth of at least 3.0 percent is need to raise inflation to the Fed’s 2 percent target, analysts say. U.S. employment fell in September for the first time in seven years as Hurricanes Harvey and Irma left displaced workers temporarily unemployed and delayed hiring, the latest indication that the storms undercut economic activity in the third quarter.